Lyndon Baines Johnson was the 36th president of the United States. The Lyndon B. Johnson National Historic Park is located at two sites in and near Johnson City, TX. The Johnson City Unit is located on the edge of the town and includes his boyhood home and a visitor center. The LBJ Ranch Unit is about 14 miles west of Johnson City and includes his ranch and a reconstruction of the house where he was born. We were interested in the historical facts surrounding LBJ's ranch and presidency, so we decided to visit the LBJ National Historical Park. In 1908, LBJ was born in a small farmhouse in Stonewall, TX, which is only a short distance west of the ranch. A reconstruction of the house where he was born is located in the western unit of the park near the ranch. The farmhouse is another example of a dog trot house where there is a central, open breezeway. 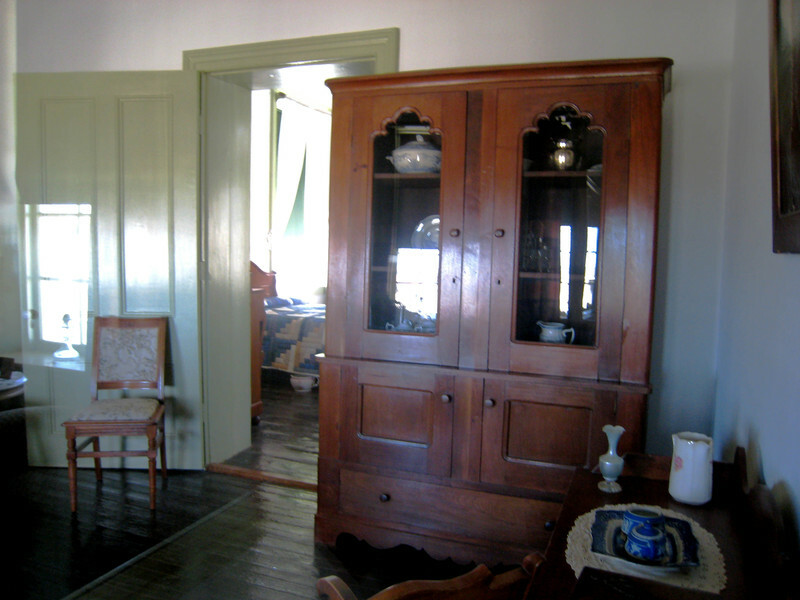 You can look into some of the rooms of the house, but it is not open for tours. Lyndon Johnson attended Junction School, a one-room schoolhouse that was located a short distance down the road from the house where he was born. National Park Service bought the land where the school is located so it is now part of the Ranch Unit of the park. Lyndon Johnson only attended the Junction School for a few months in 1912 because the school was closed down due to a whooping cough epidemic. Then LBJ's father, who felt he wasn't cut out for farming, moved the family to a house in Johnson City in 1913. The eastern part of the park is located in Johnson City at the site of boyhood home, which is shown below. The house in Johnson City is fairly modest and was without electricity until the late 1920s or 1930s. It was built from prefabricated components bought out of a Sears catalog by the previous owner in 1901. There was indoor plumbing (cold water only), but just for the bathtub and the kitchen sink. Used bath water drained onto the ground under the house. There was an outhouse in the back yard. In the next photo you can see the single faucet at the kitchen sink on the far left. The photo below shows the dining room. The black box on the side table behind the dining table is an early radio. The round, black object next to the radio is a megaphone-type speaker similar to what was used on the old Gramophones. The family had one of the first Model Ts in town, and without electricity in the house, the radio was powered by the car battery. You had to drive the car around during the day to recharge the battery so you could listen to the radio in the evening. The visitor center at the Johnson City Unit has a lot of information on LBJ and his early life and political career. After graduating from high school, Lyndon Johnson attended Southwest Texas Teachers' College and graduated in 1930. His father served 5 terms in the Texas legislature. Young Lyndon Johnson showed a penchant for politics having been elected president of his 11th grade class, and having been involved in debates and campus politics in college. He taught public speaking and debate at a high school in his early teaching career. After campaigning for a Texas state senator who was running for the U. S. Congress, Johnson was offered a job as legislative secretary for another U. S. congressman. Johnson married Claudia "Lady Bird" Taylor in 1934. In 1937, he successfully ran on a New Deal platform for the U. S. Congress himself. LBJ ran for the U. S. Senate in 1941, but was defeated. He continued to serve in the House until 1949 when he finally did win a seat in the U. S. Senate. He was chosen as minority leader by the Democrat party in 1953, and he became majority leader when the Democrats took control of the Senate in 1954. 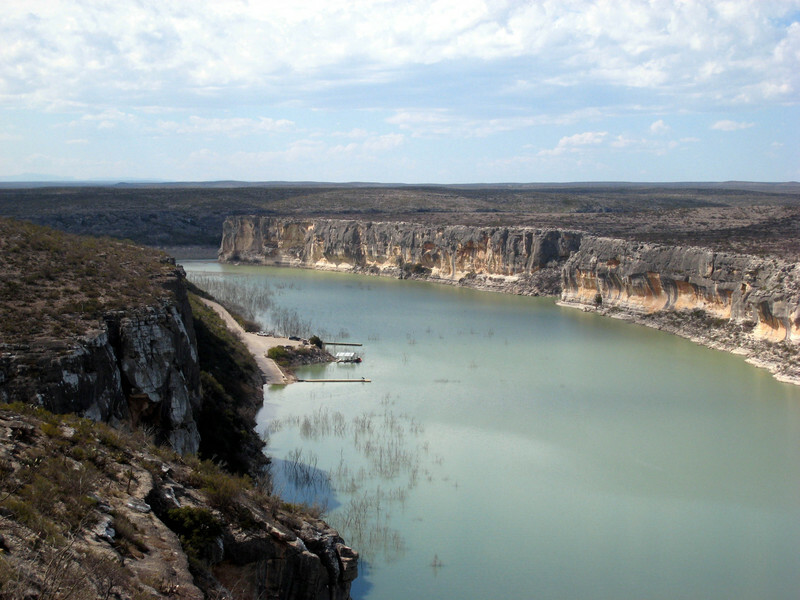 In 1951 during his time as a senator, Johnson's aunt sold him her old ranch located on the Pedernales River very near the house where he was born. The ranch house was in pretty bad shape by the time Johnson got it, but a series of renovations, repairs and an addition helped get it into shape to fulfill his dreams of becoming a rancher. The ranch was only about 250 acres when LBJ got it, but he built it up to a 2,700 acre showplace complete with its own airstrip. In 1960, Johnson was elected Vice President serving under John F. Kennedy. LBJ became President when Kennedy was assassinated on Nov. 22, 1963. During President Johnson's administration, the LBJ Ranch served as the Texas White House. Lyndon and Lady Bird went to the ranch often where they could escape some of the pressures of Washington, D. C. But they couldn't escape the pressures of the presidency, and they even added an extra wing to the house to serve as a presidential office. The office is the low section of the house to the left of the large tree in the above photo. LBJ was re-elected President in 1964. He known for his role in escalating American involvement in the Vietnam War. He is also known for civil rights legislation, the "War on Poverty" that created programs like Head Start and food stamps, the creation of Medicare and Medicaid, as well as the passage of environmental and conservation legislation. Although Johnson was eligible to run for another term as President, he announced on March 31, 1968 that he would not run again. President and Lady Bird Johnson settled into the ranch life. LBJ spent his final years writing his memoirs and overseeing the construction of his presidential library in Austin. He also liked to ride around the ranch in his white Lincoln convertible and oversee the cattle operations. LBJ died at the ranch in 1973 at age 64 of a third heart attack. 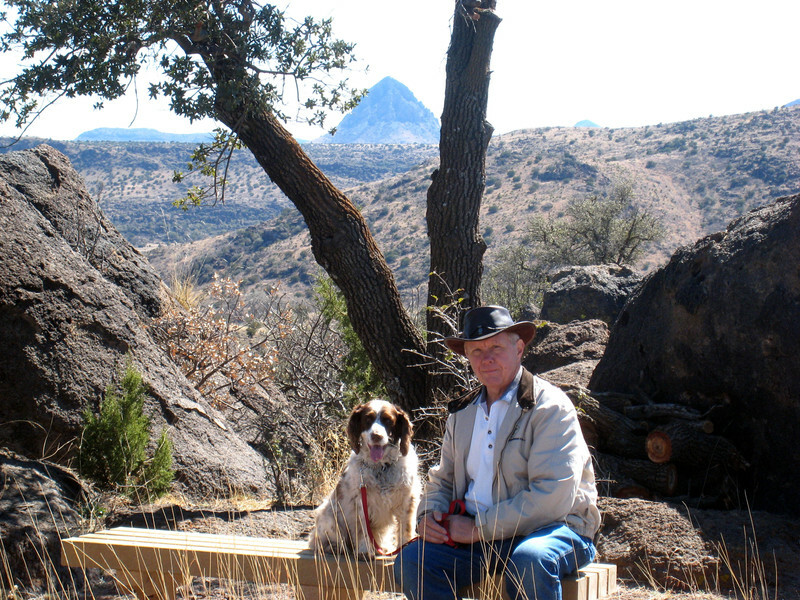 The Johnsons had donated the ranch to the National Park Service in 1970 with the provision they would have free use of the home for life. Lady Bird continued to live at the ranch until her death in 2007. Lady Bird was instrumental in many beautification projects around the nation and in Hill Country. The Wildflower Center that we visited previously was one of her pet projects. The family cemetery is located on the ranch. Numerous members of LBJ's family are buried in the cemetery including his parents. LBJ's headstone is the large one in the center to the right, and Mrs. Johnson's is the large one to the left. Lady Bird had converted the presidential office into a family room, but all the original furnishings, draperies, and carpeting had been placed into storage. After Lady Bird's death, the office was restored to its original appearance and opened to visitors in 2008. A few additional rooms were recently opened for ranger-guided tours. Other rooms are being restored and will be opened in the near future. Unfortunately, photography is not permitted inside the house, so we can't show you any of the interior. We can, however, show you a cow and new calf that were in the show barn. Although greatly diminished in size, the ranch is still a working ranch today raising Hereford show cattle the same way LBJ did. Notice that the cow is branded on her horn rather than on the hide. This is the method used at the LBJ Ranch. An identification number is branded on the other horn rather than using an ear tag. Unlike a hide brand, the animal can't feel the horn branding at all, but the drawback is it must be redone periodically as the animal's horns grow. It was interesting to learn more about the history of our country from back in the 1960s as well as to learn what a big influence Lady Bird was both in the nation and in Texas Hill Country. We'll have more Hill Country adventures to tell you about in our next post. The Alamo, which was originally called Mission San Antonio de Valero, was one of a string of 5 missions started in the early 1700s by the Spanish along the San Antonio River. The Alamo is the most famous of the missions because of its role in the battle for Texas independence, but Mission San Jose is called "Queen of the Missions" because it was the largest. After spending the early part of the afternoon at the River Walk, we decided to drive a few miles south of downtown San Antonio to Mission San Jose. Mission San Jose and three of the other missions along the San Antonio River are part of San Antonio Missions National Historical Park. The Alamo is operated by the Daughters of the Republic of Texas and is not part of the historical park. Mission San Jose is where the visitor center for the San Antonio Missions National Historical Park is located, and we arrived just as a ranger-led tour was getting started. In our experience, the ranger-led tours are very informative, so we quickly joined the group. The missions along the San Antonio River were established by Spain to convert the Native Americans in the area to Christianity and to educate and to civilize them. Mission San Jose, which was established in 1720, was the second of the San Antonio missions. The Mission San Antonio de Valero (the Alamo) was the first. The first structures at Mission San Jose were temporary log structures. By 1749 there was an an adobe church as well as a granary, friary and Indian quarters. The existing limestone church was completed in 1782. Because of a long-lasting drought in the area, the Indians were attracted to the missions even though they distrusted the Europeans, and even though it meant a significant change in their way of life. They were originally hunter-gatherers. Although they were not nomadic, they did move to different areas within their territory to follow game and to seek out various plants at different times of the year. The Indians did not farm, but would have to learn farming and other trades as part of their life at the mission. The goal of the Spaniards was to have the Indians live and worship as Spaniards and to ultimately live independently of the mission. The local Indians were also coming under attack by nomadic peoples such as the Apache and Comanche. When the Apache and Comanche were able to obtain horses by rounding up the descendants of horses that had escaped from early Spanish explorers, their raids increased. Walls were added to the mission complex for protection. The walls had living spaces built into them, and each family of Native Americans would have a two-room apartment. Vaqueros would tend cattle some distance from the mission to keep the cattle away from the crops since there was no barbed wire for fences back then. They would drive a supply of cattle to the mission every week or so. The early missions were where cattle ranching started in North America. The church itself, as well as the other three San Antonio missions that are part of the National Historical Park system, still have active Catholic congregations. In a unique agreement reached a number of years ago, the church pays for the upkeep of everything they use in their worship, and the Government pays for everything else. Behind the church are modern (more or less) offices, and even a small flower garden. A grist mill was added to the mission between 1790 and 1794. In the late 1700s, the missions began to decline, primarily due to a small pox epidemic, and Spain divided up the mission lands, the domesticated animals and tools among the Indians. Although the churches continued to hold mass, the compound around the mission was no longer needed. The Indians and other locals carried off much of the stone from the compound walls to use for other buildings. The mission walls that stand at San Jose today were rebuilt in the 1930s by the WPA. The churches themselves began to fall into disrepair even though they were still in use. Today, the Mission San Jose has been largely restored. The photo below shows another view of the mission. Behind the church was the residency of the missionary. This part has been stabilized but not restored, and the roof is missing. Only the arched walls remain. This may seem like quite a large space for only one man to live, especially one who had taken a vow of poverty as a Franciscan friar, but the front area was a large open hallway for circulation of cooler air. There were also other rooms such as storage rooms and guest rooms for traveling dignitaries from the Spanish government and from the Church. Visitors frequently stayed for long periods. It was an interesting tour because the ranger was able to give us a more personal look into the lives of both the missionaries and the Indians. Unfortunately, it was almost 5:00 closing time by the time we finished looking around, so we weren't able to visit any of the other three missions that are part of the San Antonio Missions National Historical Park. We'll have to save them for another visit. We like the San Antonio area - that's the reason we returned this year - and we're likely to be back again at some time in the future. But for now, we'll be on our way to a new stop in the morning, so stay tuned. We left Tonopah, AZ, with temps in the 70's heading for southwest Texas hoping the weather forecast for highs in the upper 60's would hold. Our destination was Davis Mountain State Park, elevation 5-6,000 feet. Similar to our travels west earlier this year, we ran the gambit of weather. 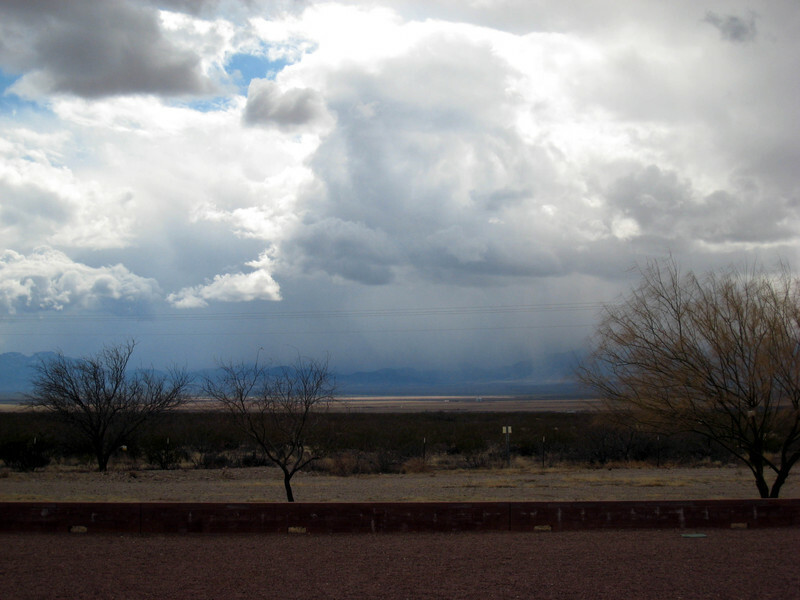 Going across the Sonoran Desert, we were captivated with the clouds and weather we could see in the distance. 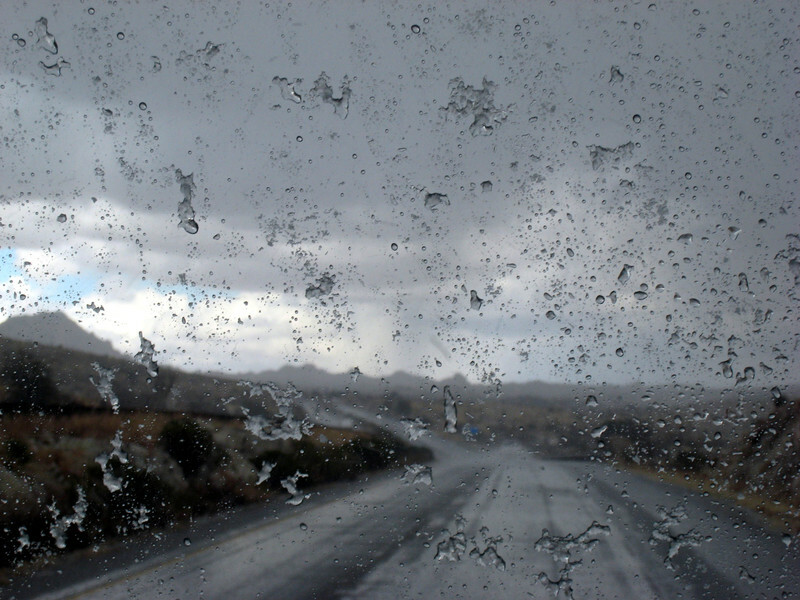 As we climbed in altitude crossing New Mexico on I-10, we encountered lumpy "rain." We waited out the weather at the Escapees' Dream Catcher Park in Demining, NM. This full-hook-up campground with pull-throughs is close to I-10 and is an easy in/out. As we approached El Paso, TX, the Rio Grande River becomes the border between the United States and Mexico. 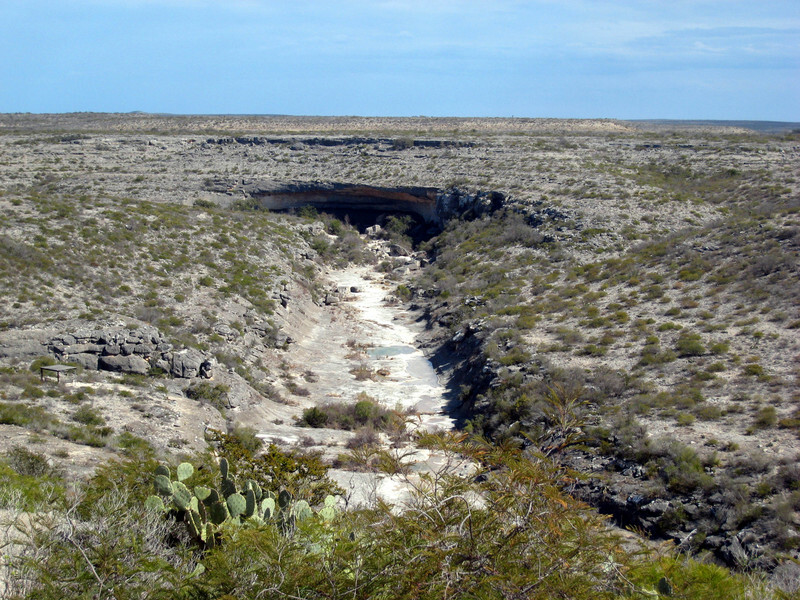 This 1,885-mile river which begins in the San Juan Mountains in southwest Colorado flows south through the middle of New Mexico and then southeast as the border between Texas and Mexico emptying into the Gulf of Mexico at Brownsville, TX. 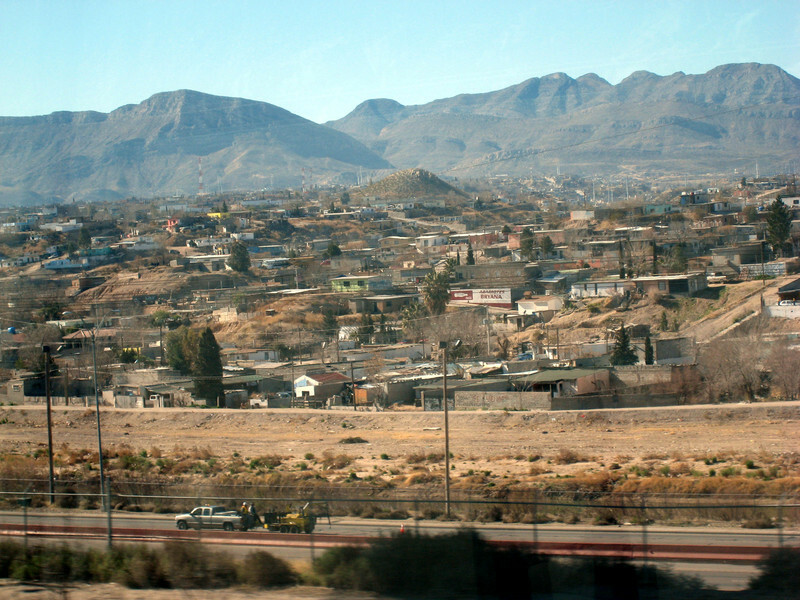 It's not exceptionally wide as it passes between El Paso and Juarez, MX, and Mexico is easily seen from I-10. "So near and yet so far" came to mind as we thought about the many people who risk so much to enter the US. 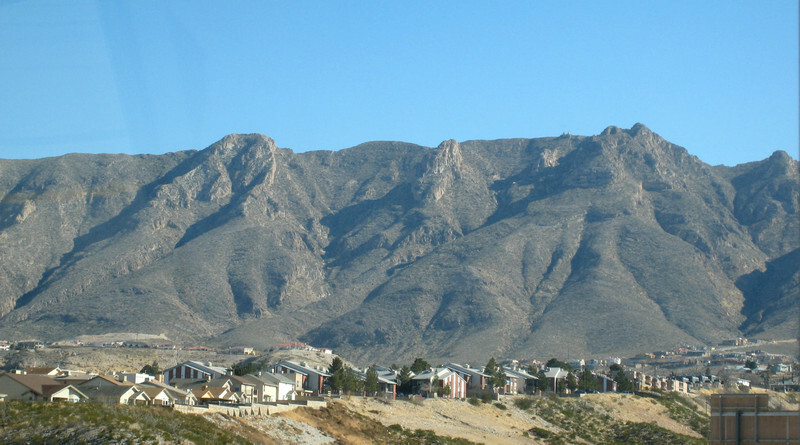 Across from where the above photo was snapped, we were struck by how dwarfed these El Paso houses looked by the mountains behind them. Davis Mountain State Park was our homebase for four days while we explored the area. This full-hook-up campground is in the most extensive mountain range in Texas, and we were captivated by its rugged beauty. While we were setting up, a herd of mule deer grazed freely and were not at all shy. 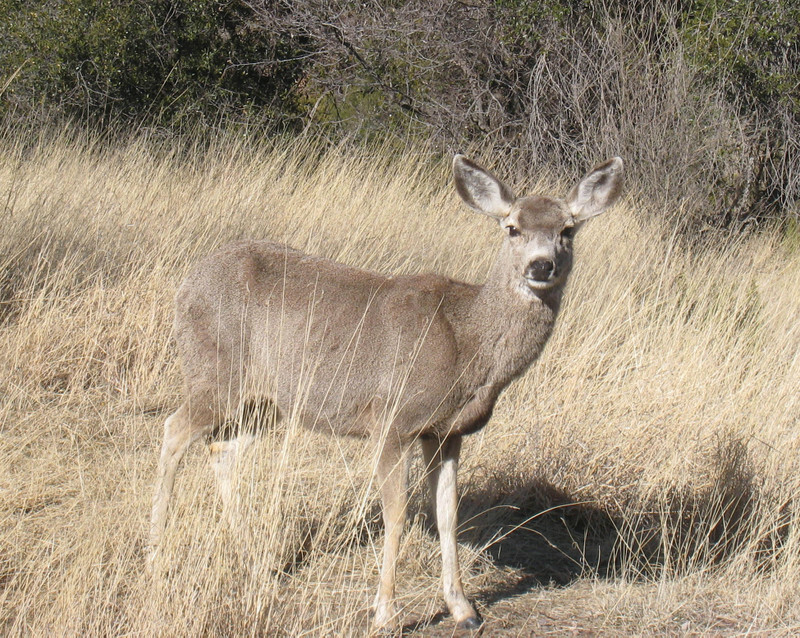 Mule deer have larger ears than the white-tail deer found in Pennsylvania. Our drive to the top of one of the peaks in the park provided us with a stunning view of the area. 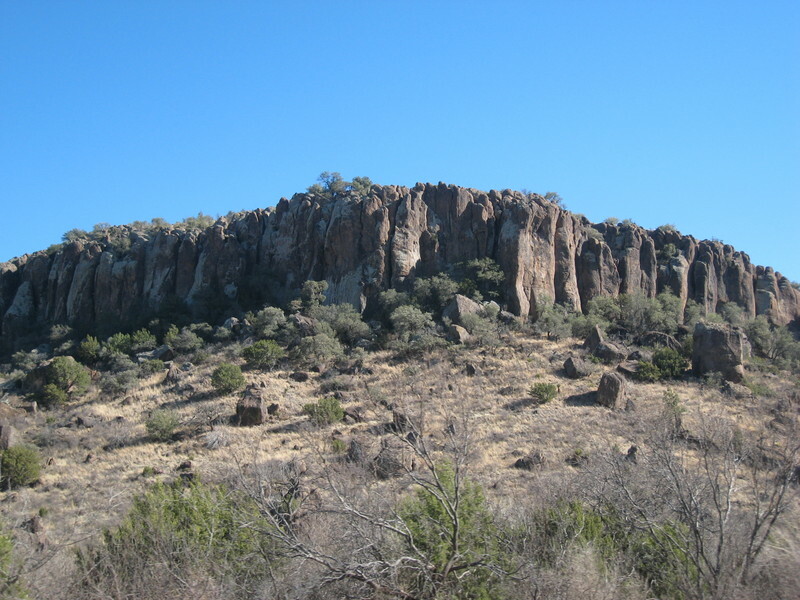 The state park is just 4 miles north of Fort Davis, a military post from 1854 - 1891. Abandoned during the Civil War by Union Forces, it was re-occupied and re-built in 1867 for the newly organized Ninth U.S. Cavalry. The standard of living in this 1867 re-built frontier outpost seemed to us to be rather sophisticated. These furnishings were ordered by Commanding Officer Benjamin Grierson's wife specifically for their move to this residence. Leisure-time diversions included a band, a library, a chapel and a school. Because many officers had their wives and families with them, the women organized social events, i.e., balls, charades, and dinner parties. 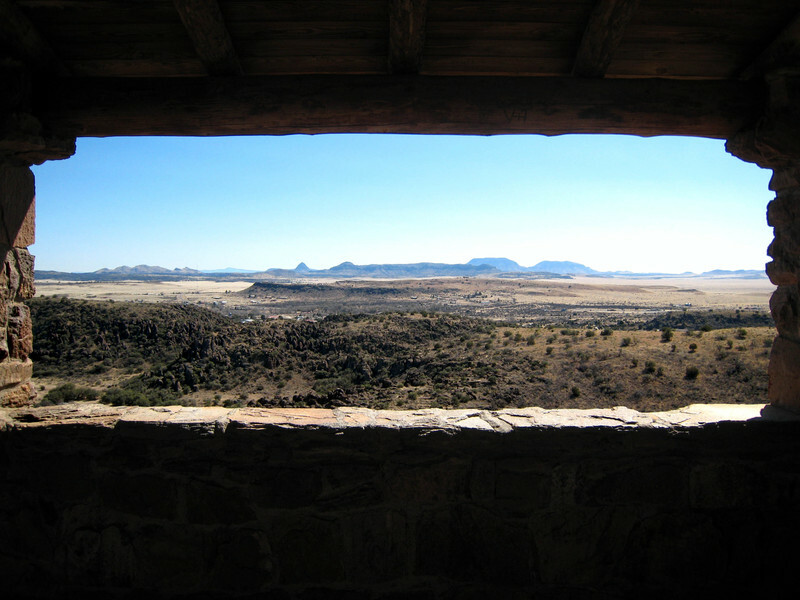 Fort Davis is 30 miles north of the town of Marfa, home of the Marfa Lights. These orb lights have an unexplained history. Ten miles of the road to Marfa was dirt while it's being re-constructed, so we put an excursion to see the lights on our "to do" list in the future. 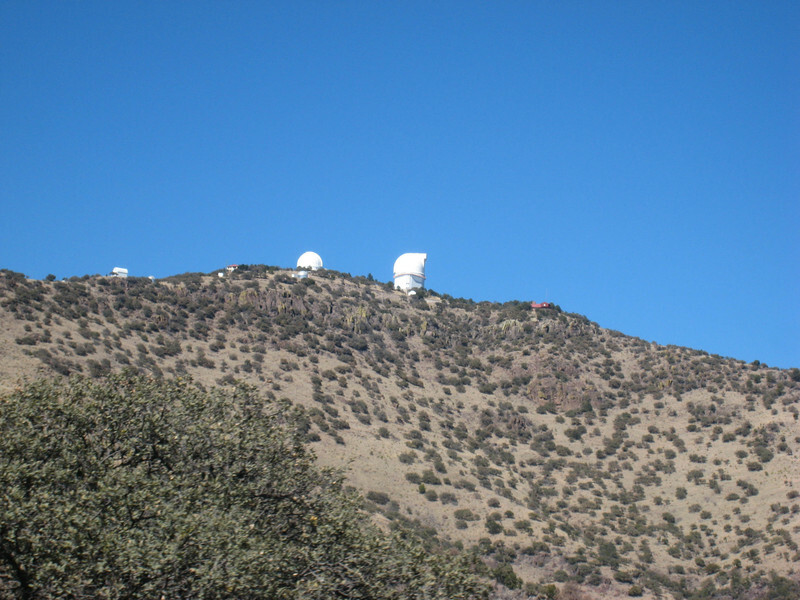 However, we did attend a Star Party at the McDonald Observatory which is part of the University of Texas at Austin. The night was clear (with temps in the low 30's) which enabled us to see an incredible array of stars. We viewed the sky through several telescopes but the most captivating and memorable for both of us was seeing Saturn complete with rings. It was an amazing experience. The observatory could be seen from a distance. Not far from Ft. Davis is the Chihuahuan Desert Research Institute where we toured the outdoor exhibits and botanical gardens. This is a great view of Mitre Peak which saw when we were on the Hummingbird-Butterfly Trail. There was an excellent and educational mining exhibit. 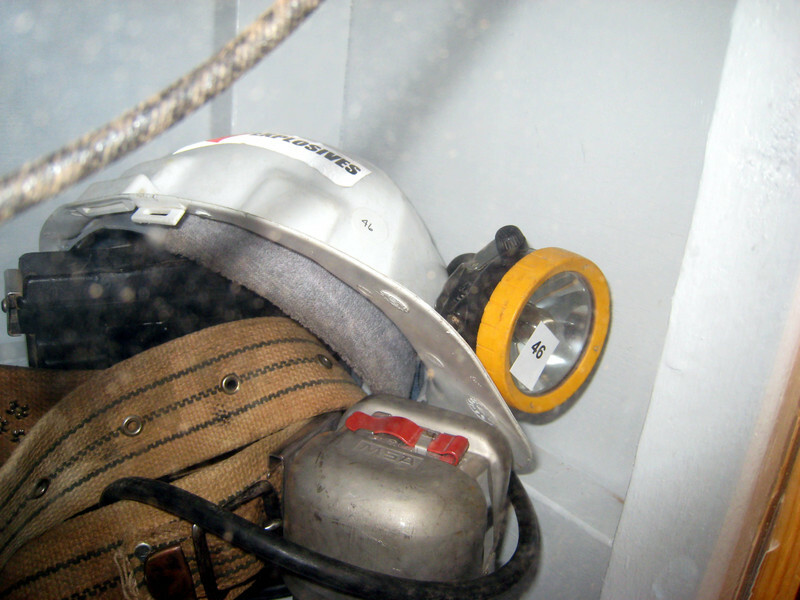 What a thrill to find this MSA Mine Spot mine lamp on display. As a manufacturing engineer for MSA, Paul oversaw the building of quite a few of the molds used to make this very lamp. Leaving Davis Mountain SP, we continued south to Seminole Canyon State Park. Home to Native American rock art, The Fate Bell Shelter Tour is a rugged hike to the bottom of the canyon to see the pictographs first hand led by members of The Rock Art Foundation. The rock overhang in the distance is the Fate Bell Shelter. Although it's hard to tell from the photograph, the floor of the canyon at this point is at least 100' below the rim. Unfortunately, because of the ruggedness of the trail and Margery's bad knees, we were unable to take the tour, but the state park headquarters had an outstanding interpretive center. Wondering where the canyons that crisscross this area come from, we learned that hurricanes which hit the lower southwest edge of Texas can dump up to 20 inches of rain in this area helping carve out the canyons. The area around Semiole Canyon is one of those diamonds in the rough. 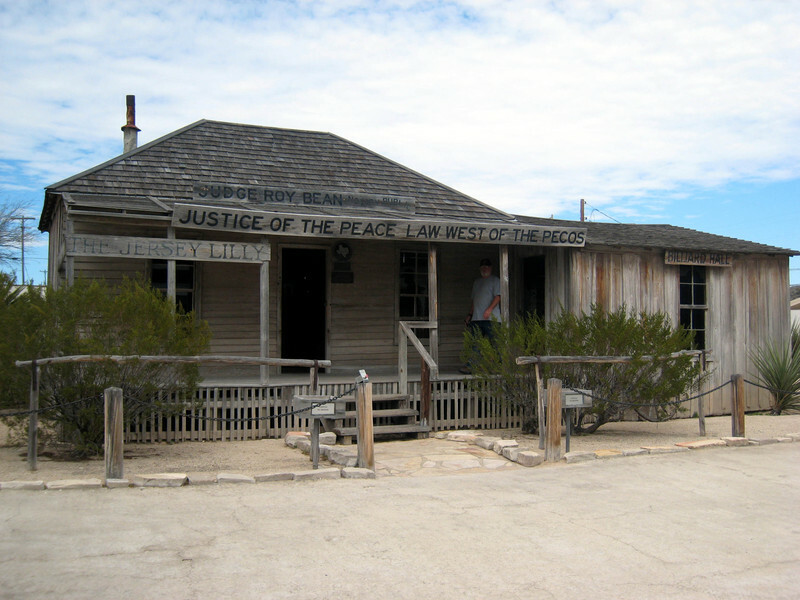 A short distance from Langtry, TX, we toured Judge Roy Bean's Saloon and home. Known as "The Hanging Judge," there's no evidence that he ever hanged anyone. One or two were taken to the gallows, but were allowed to escape. 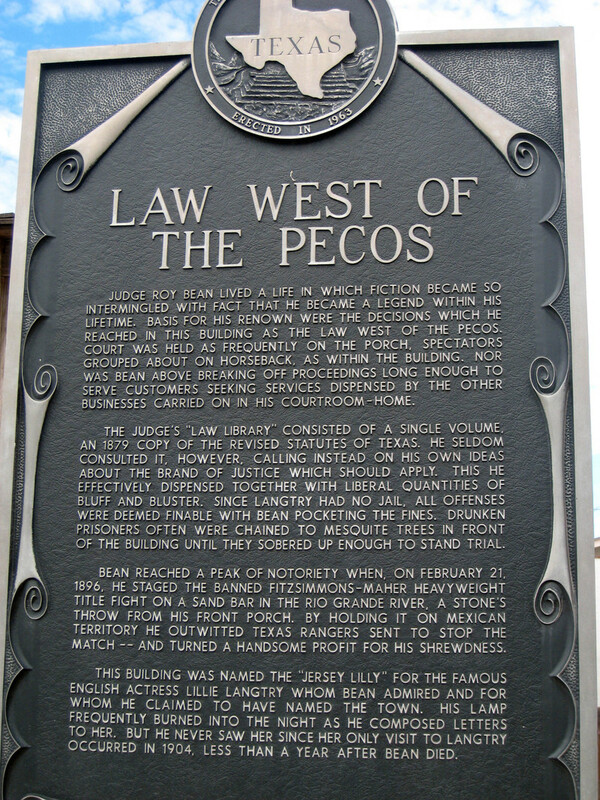 This colorful character was self-named "the Law West of the Pecos." 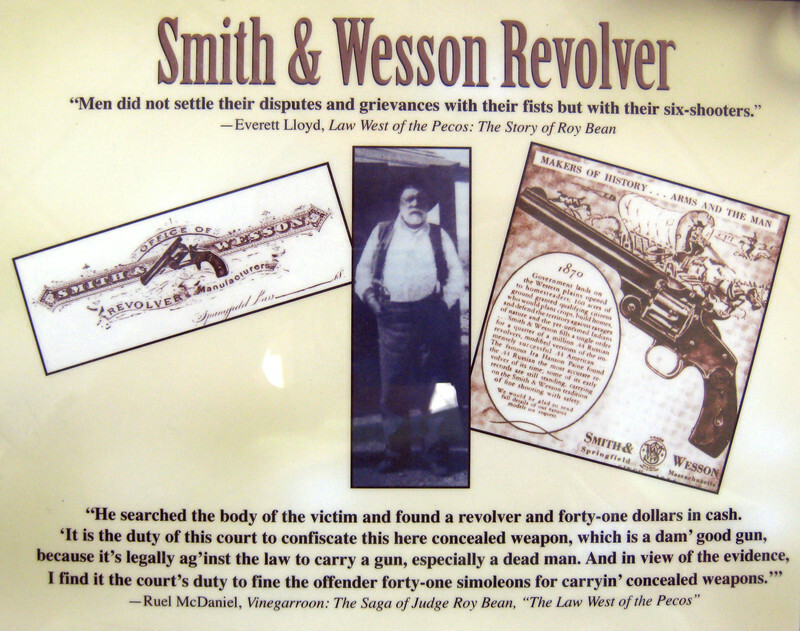 Only in the old west could a murderer known for dueling, gambling, and swindling by selling watered-down milk and stolen firewood be appointed a Justice of the Peace. Here is a sample of Judge Bean's "law." Between Langtry and the state park, there were some great observation points. Here in the foreground you see the Pecos River. Right beyond the cliff at the end of the far bank it flows into the Rio Grande River. The hills in the distance are in Mexico. One of the benefits of keeping a loose travel schedule, is the freedom to change plans on a moment's notice. Seeing an advertisement for Alamo Village, "the most active and versatile outdoor movie set," we put it on our itinerary. Located in Brackettville, it was built by John Wayne and ranch owner Happy Shahan in the late 50's for John Wayne's movie, Alamo. This working movie set includes no false fronts and everything needed for a western film, i.e. hotel, bank, sheriff's office and jail, undertaker's shop, blacksmith, and livery among many other buildings including, of course, a replica of the Alamo. Today, the real Alamo in San Antonio consists only of the restored mission building. When defended by the famous freedom fighters, however, the Alamo was a sprawling mission-fortress covering nearly four acres of ground. John Wayne and Happy Shahan constructed two distinct areas: the Alamo mission complex and the western/Mexican town. During our visit, we met the "marshal," Rich Curilla, a fellow-Pennsylvanian and a '69 Penn State graduate in film production. Rich was a wealth of information about the movies and stars who are part of the Alamo Village history. He had great stories to share about Jimmy Stewart, James Garner, John Schneider and Matt Damon; but his all-time favorite was Mary Stuart Masterson who stared with Drew Barrymore in Bad Girls filmed in 1993. 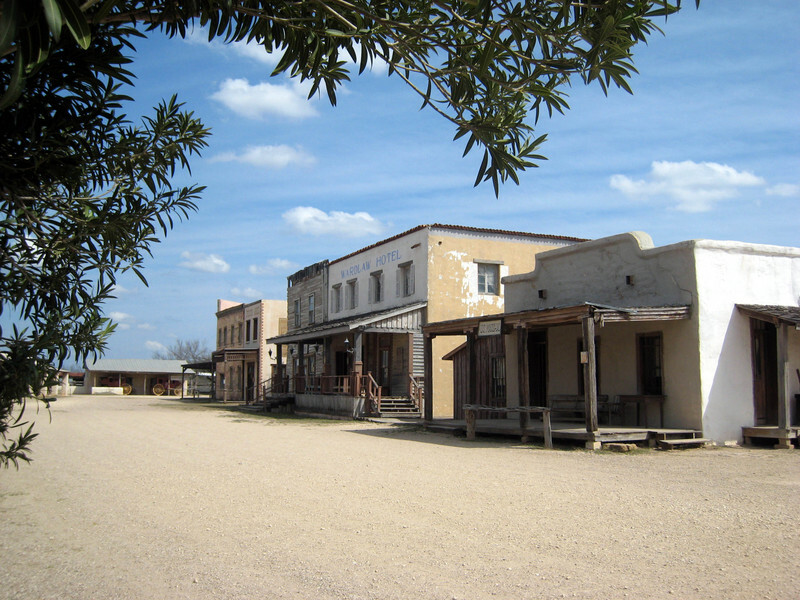 More than 200 major motion pictures, music videos, commercials, and documentaries have been filmed here including Lonesome Dove and James Michner's Texas. The next filming is scheduled for early May, and the Village will be open to tourists during filming. Marshal Curilla helps tourists find the best viewing locations without disrupting the filming. Rich told us about some ambitious plans on the drawing board for Alamo Village, and we look forward to returning in the future. Historic Fort Clark Springs was our "home" during our visit at Alamo Village. Fort Clark was established on the banks of Las Moras Creek by the U.S. Army in 1852 to protect a segment of the "lower road" from San Antonio to El Paso as well as frontier settlers from Indians and bandits. Virtually all cavalry units including the the 9th and 10th "Buffalo Soldiers" were stationed here before it was decomissioned in 1946. General George Marshall, US Chief of Staff, and General George Patton, famous for his operations in North Africa, both during World War II, served here in the late 30's. Today, Fort Clark is a gated resort and leisure-living community. 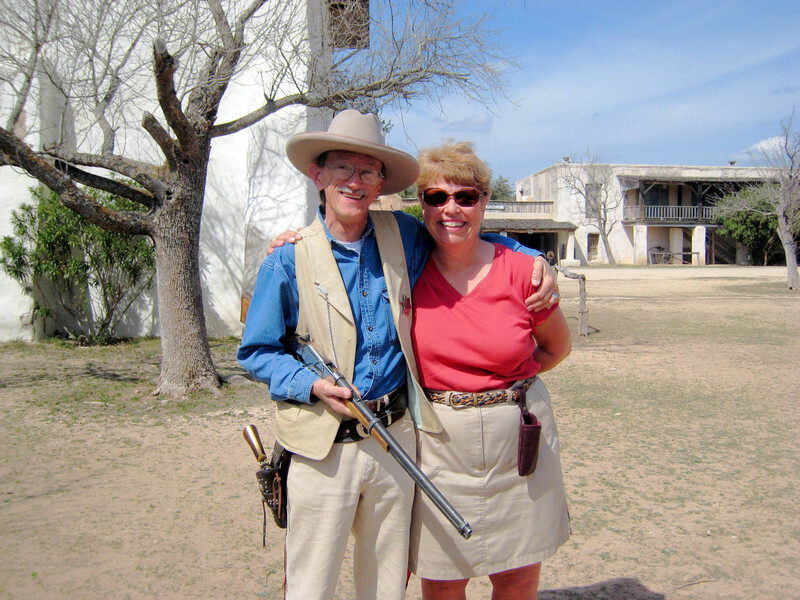 Over 80 historic buildings, many still in use for their original intended purposes, are preserved in this unique community which includes an RV park with full-hook-ups and Texas-friendly residents. Lake Casa Blanca International State Park is located in Laredo, TX; and it was our "holding" location until it was time to check-in to our March destination. This was a busy, suburban park that saw a lot of activity during the week and on the weekend. The Mexicans are a fun-loving people who enjoy spending time together as a family. 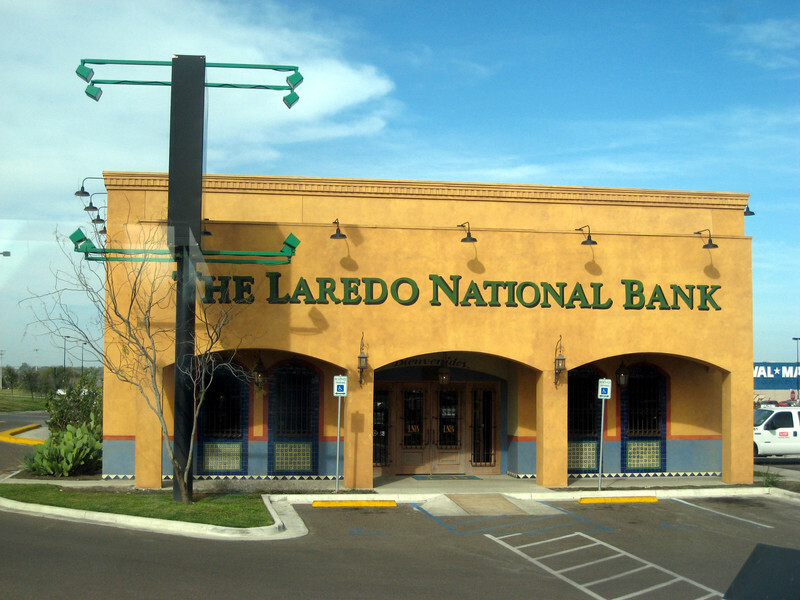 Laredo was a charming city with a shopping district down by the Laredo International Bridge to Mexico that reminded us of "The Strip" in Pittsburgh...full of colorful, ethnic stores. We were struck by the architectural appeal of the area. We had made reservations for the month of March in Bentsen Palm Village in Mission, TX, so our transient travels through southwest Texas came to an end all to quickly. We didn't have time to visit Big Bend National Park but we've put it on our list for another time. However, we were looking forward to staying planted in one place for month, the longest we will have spent in one place since we went on the road last July. Check out the Photo Album: 014: Journey to South Texas for pictures of the campgrounds we visited and more pictures of our adventures.